The intention of eliminating this rule was to simplify our rules and to better align with the ISAF and the Racing Rules of Sailing. We seem to have forgotten why this rule was written in the first place, and none of those of us who are responsible for vetting these changes picked up on the significance of making this change ­ that it would allow hiking between the lifelines on boats equipped with upper and lower lifelines. Once the Class Rule had been removed and competitors began to hike between the lifelines, there was a very broad cry internationally to reverse the change and not allow hiking between the lifelines as is clearly allowed in RRS 49.2. We were only slightly ahead of our times since the ISAF has a proposal before it (130-06) to delete the section of RRS 49.2 that allows hiking between the lifelines. This proposal may or may not be approved for the 2013 Racing Rules of Sailing, but it is clear that there is broad interest in disallowing this practice in our sport. After a vote by the IJCA Executive Committee and approval by the IJCA Technical Committee, the IJCA has submitted a proposal to ISAF for an emergency rule change to reinstate former rule 8.3 as new rule 8.4. 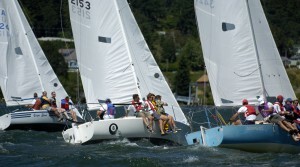 In the interim, it is suggested that all Notices of Race and Sailing Instructions for all J/24 events include the following language: “No member of the crew shall station any part of his/her torso outside the upper lifeline other than temporarily, notwithstanding the provisions of RRS 49.” When using the IJCA standard documents, this should appear in section 1.4 of the NOR and SIs. We apologize for any inconvenience this change and its reversal might have caused, but the IJCA never intended to allow hiking between the lifelines.